Jews around the Metroplex, young and old celebrated Israel Independence Day last week. Whether at the JCC’s community celebration or at parades at area preschools and day schools, folks got in the spirit, donning blue and white and waving the Israeli flag proudly. The Dallas Jewish community came together at the JCC to celebrate Israel’s 62nd year of independence. The event was planned by a committee comprising representatives from 30 Jewish organizations in Greater Dallas. The Jewish Federation of Greater Dallas provided generous funding for the festivities. Close to 2000 people participated in activities on the JCC campus. The warm, sunny afternoon allowed wonderful outdoor as well as indoor activities. Attendees were fortunate to have authentic Israeli entertainment. Bein Hametarim, a musical ensemble from Akko, our partnership region in Israel, performed on the plaza in front of the J while community members danced, sang and waved flags in time with the music. As people moved to the music, they feasted on falafel and pizza. Activities for the kids included bounce houses, carnival games, arts and crafts, face painting and a petting zoo. All ages walked the Big Map of Israel, put notes into the Western Wall and had their pictures taken by Gladtower Productions with a backdrop of Israel; everyone loved posing in an Israeli army Jeep. Wonderful mitzvah projects as well as learning opportunities were available. This was an incredible community event from beginning to end. An amazing committee with representatives from all Dallas Jewish organizations was led by Event Chairs Stacey and Doug Baer, Sue Ellen and A.J. Rosmarin and Bonnie and Jeff Whitman. The community thanks the chairs and their committee. The children of Congregation Beth Torah Preschool celebrated a spirited schoolwide Yom HaAtzmaut program as they became Israeli in their imaginations. These junior archaeologists went digging for exciting treasures buried in the school playground — glitzy, shiny “historical and ritual” items were found and marveled over. The children dug and dug, putting all their little items in baggies and learning the significance of each treasure. Larger objects were placed near a beautiful representation of the Temple. The ancient Temple seemed really ancient to the youngsters, who typically think being 10 years of age is very old. To observe the holiday, the children made a great birthday cake for Israel’s birthday. The 4-year-old class painted pillowcases with the Israeli flag and then wore them so they themselves “became” the flag. Swaying in the breeze, over a hundred “flags” sang and danced on the playground. Registration applications for the preschool summer program and for the fall school year are now being accepted. For further information, please contact Esther Cohen at 972-234-1542. Congregation Beth Torah is located at 720 Lookout Drive, Richardson 75080. Akiba Academy held a parade and had a blue-and-white spirit day. The TJP wishes to thank community reporters from Akiba, Beth Torah and the JCC for sending in pictures of their Yom HaAtzmaut celebrations. If you would like us to post your Yom HaAtzmaut photos online, e-mail them to sharonw@texasjewishpost.com. Memorial Day in Israel rings through with a siren. A piercing sound, stopping all at attention, all who knew one or many who gave their lives in wartime and peacetime, in the name of independence and in the name of sustenance, for a land for the Jewish people. On Monday, April 19, a siren rang through Levine Academy in a hall filled with people young and old, Israeli, American and those from other lands, Jews and others, stopping to remember, to dedicate, to commemorate. To memorialize. The Yom HaZikaron commemoration included readings, songs and prayer from members of Dallas’ Jewish community, as well as the songs and dances of Israel as performed by members of Bein Hametarim, a troupe from Akko, a part of Dallas’ Partnership region in Israel. “Twenty-seven percent of the money raised by the Jewish Federation of Greater Dallas’ Annual Campaign is donated to Israel and other overseas countries, with some of the funds used to support medical and cultural projects,” said Meirav Yaaran, senior campaign associate for the Jewish Federation of Greater Dallas and director of Café Israel who, in collaboration with Congregation Nishmat Am, sponsored the event. David Veeder, chair of the Jewish Federation of Greater Dallas; Congregation Beth Torah’s Rabbi Adam Raskin, president of the Rabbinic Association of Dallas; Congregation Nishmat Am’s Rabbi Yitzchak Cohen and Cantor Ya’akov Cohen; Congregation Beth Torah’s Learning Center Director Ruth Schor and other sabras, now Dallas residents, Rabbi Rivka Arad Anderson, Mali Gariani, Michal Kidron, Israel Osterreicher, Shai Rybak, Assaf Sella and Yaaran brought the meaning and soul, the ruach and memory of the occasion, to light. “From the music to the dance, and the prayers to the core of our beings, this is a night, and these were sacrifices, to always remember,” Yaaran said, referring to the celebration and onset of Yom HaAtzmaut, Israel’s Independence Day, at the end of the evening. “It is the story of our life and our people to go from sadness to joy. “The greater Dallas Jewish community has embraced the outreach of the Israeli community — its networking, its talents, it professional contributions and its socialization — and tonight wasn’t just for the Israeli community, it was for our community,” said Yaaran, who thanked Waldman, Café Israel members including the group’s Chair of Volunteers Odeya Zach, Levine Academy’s Esther Jogiel and Wende Weinberg, the Federation’s Deborah Fisher and Gary Weinstein, the JCC’s Laura Seymour and Rachelle Weiss-Crane, and Congregation Nishmat Am’s Mali Gariani and Michal Kidron for their help in coordinating the event. The 1947–1949 War of Independence. The 1956 Suez War. The 1967 Six-Day War. The 1973 Yom Kippur War. The Lebanese War of 1982 and the Second Lebanese War of 2006. The names of Ron Arad and Gilad Shalit and the thousands who have been captured, tortured and/or killed. Moments to memorialize, thousands of miles away from the action, miles that can’t be counted in the hearts of Jews around the world. When the students in the Ann and Nate Levine Academy’s class of 2010 departed for Israel on March 7, not one of them could imagine how Israel would change their lives. For almost three weeks, they experienced the beauty, diversity, spirituality and wonder of that country. This trip was more than a tour: It was the culmination of their Jewish education and development, as well as the pinnacle of their Jewish affirmation. They saw, touched and tasted all the things they had read and learned about over their years at Levine. Dallas Can! Academy, a nonprofit organization giving young Texans a second chance through relationship-based education, will present the Lifetime Achievement Award to State Sen. Florence Shapiro at its 17th annual Motherhood Event, 11:30 a.m. on Tuesday, May 4 at the Rosine Hall of the Dallas Arboretum. The luncheon, presented by Kimberly-Clark Corporation, annually recognizes women who exemplify family and community leadership in North Texas and benefits the students at the Dallas Can! Academy. The event celebrates women in North Texas who have made a positive impact in their communities and in the lives of others as civic leaders, volunteers, role models and mentors as well as within their own families. Senator Shapiro will be honored for her outstanding achievements and dedication to her family, state and community. She has held numerous elected and volunteer leadership roles in the North Texas community. Proceeds from the luncheon will benefit the students and programming at Dallas Can! Academy, providing a second chance for at-risk youth and their families. Current Dallas Can! students will speak about their experiences and goals for their education. As a dedicated state and civic leader, Senator Shapiro has received a wide array of recognition and is known as a champion for children and youth. Among many awards and achievements, she is a former public school teacher and is current chair of the Senate Education Committee. Her landmark legislation and series of bills, known as Ashley’s Laws, were national benchmarks for improving the safety and security of children. She first entered elected office as a Plano City Council member. Following six terms on the council, she was elected mayor of Plano. During this time, she also served as president of the Texas Municipal League and the North Texas Council of Governments. In 1999, Senator Shapiro became chair of the Senate Committee on State Affairs and committed herself to the issue of transportation, creating the first fund for Texas mobility. In 2003, after becoming chair of the Senate Education Committee, she passed legislation to overhaul the state’s school finance system, replace the TAKS test with end-of-course exams and incorporate postsecondary readiness standards within the Texas curriculum and system of accountability. Amongst other achievements, she has advocated for improving teacher quality and retention through merit pay, better utilization of technology in the classroom — including the Virtual School Network — and postsecondary readiness programs that prepare students for successful lives as active and engaged citizens. Her leadership has earned her many honors over the years. She was named to the Legislative Honor Roll by the Texas Association of Realtors, and received the Celebration of Enterprise Award as the public official business partner of the year, given by Inside Collin County Business; the Bob Bullock Award for Public Stewardship, given by Government Technology Conference; the Real Women Award from the Girl Scouts of the USA Tejas Council; and the Outstanding Service Award from Independent Colleges and Universities of Texas. Shapiro is a graduate of the University of Texas at Austin where she earned a bachelor’s degree in secondary education. In addition to chairing the Senate Education Committee, she currently serves on the Senate Committee on Finance, as well as the Transportation and Homeland Security Committee and Senate Administration Committee. Proud parents and grandparents, Senator Shapiro and her husband, Howard, are Plano residents. She is the daughter of Ann and Leon Zetley and the late Martin Donald of Dallas. The Lifetime Achievement Awards Luncheon began in 1993 as a tribute to strong civic-minded women who happened to be mothers. The proceeds from the annual fundraiser support students of the Can! Academies while they earn their high school diplomas. Texans Can! Academies believe helping these students is critical to breaking the cycle of intergenerational poverty and illiteracy. The community is invited to attend the motherhood luncheon. Sponsorship opportunities are available by contacting Jennifer Mullinax at 214-944-1949 or jmullinax@texanscan.org. Individual tickets are $125 each. For more information, or to register, visit www.dallascanmotherhood.com. Twelve of Texas’ most acclaimed painters, sculptors, photographers, glass makers and metal artists will exhibit their works Sunday, May 2, at the first MOTA Show in the gallery of The Intown Chabad, 2723 Routh St.
For the uninitiated, MOTA refers to “Members of the Tribe” Artists — picking up on the folklore of the 12 tribes of Israel, according to Jeff Levine, exhibit sponsor and publisher of moderndallas.net. Dallas artist and gallery owner Dahlia Woods is curator of the show, which is open to the public from noon until 6 p.m.
All exhibition pieces are available for purchase and range from $200 to $5.000+, Levine said. Twenty-five percent of each sale will be donated to The Intown Chabad, an Uptown center uniting young adults with their Jewish roots in an informal educational and social setting. Art ranges from shimmering kinetic sculptures to glass mosaics, highly textured paintings, photography, works in clay and intriguing assemblages. The MOTA Show will be open for only six hours — making it a rare glimpse into this contemporary collection. Viewer responses to the art will run the gamut from dark reminders of film noir images to whimsical smiles upon finding plastic carnival prizes embedded unexpectedly in large assemblages. The dozen Jewish artists in the MOTA Show include Brad Abrams, Stewart Cohen, Lisa Ehrich, Celia Feld, Etty Horowitz, Bonny Leibowitz, Kenney Mencher, Jamie Pink, Morton Rachofsky, George Tobolowsky, Ellen Frances Tuchman and Dahlia Woods. Shearith Israel will tee off at The Honors Golf Club for its 18th annual golf tournament on Monday, May 10. Some of this year’s highlights include player participation by some favorite Dallas Cowboys — including Deon Anderson, #34 running back — along with Dallas Cowboys alumnus Everson Walls, Cowboys beat writer Mickey Spagnola and Candace Crawford, sports reporter for KDAF-TV, the “33 News”; a hole-in-one prize of a trip for two to Myrtle Beach, S.C. with four rounds of golf and four nights’ lodging; and a hole-in-one prize of $25,000. Other prizes will include pro shop merchandise, dining certificates to local restaurants and other valuable items from local businesses. In addition, there will be a silent auction with a chance to bid on an autographed Dallas Cowboys football and two tickets to a 2010–2011 game at Cowboys Stadium. The Southwest Jewish Congress will present educational programs relating to timely topics of local and national interest. In the first of a series of community events on the “hot button” topic of immigration reform, Dr. Stephen Steinlight, senior policy analyst for the Center of Immigration Studies in Washington, D.C., will discuss his thoughts on the immigration issue in America. Subsequent SWJC programs will present different viewpoints on this charged subject. Dr. Steinlight will speak at 7 p.m. on Tuesday, May 11 at the Aaron Family JCC, 7800 Northaven Road. This event is free and open to the public. For information, call the SWJC office, 214-361-0018. The Center for Jewish Education (CJE) of the Jewish Federation of Greater Dallas wishes to acknowledge and thank the teachers in the Dallas Jewish day, religious and early childhood schools. Close to 500 educators work hard each day to ensure the future generations of our Jewish community. The early childhood schools served by an outstanding cadre of educators include: Akiba Academy Early Childhood Program, Congregation Anshai Torah Preschool, Congregation Beth Torah Preschool and Kindergarten, Gan Menachem, The J Early Childhood Center, Ann and Nate Levine Academy Early Childhood Center, Temple Emanu-El Preschool, Temple Shalom Early Childhood Education Center and Torah Day School of Dallas Preschool. Religious schools include: ATID (Academy of Torah in Greater Dallas), Adat Chaverim Religious School, Congregation Anshai Torah Religious School, Congregation Beth Torah Learning Center, Chabad of Plano/Collin County Hebrew School, Congregation Kol Ami Religious School, Congregation Nishmat Am/B’nai Israel Religious School, Weitzman Family Religious School of Congregation Shearith Israel, Temple Emanu-El Religious School, Temple Shalom Religious School and Tiferet Israel Congregation Religious School. Day schools include: Akiba Academy, Ann and Nate Levine Academy, Mesorah High School for Girls, Texas Torah Institute, Torah Day School of Dallas and Yavneh Academy of Dallas. The mission of the Center for Jewish Education is to serve, on behalf of the Jewish Federation of Greater Dallas, as the resource to facilitate and convene the Jewish community on issues pertaining to Jewish education, to enrich existing programs and serve as a catalyst for new initiatives. It seeks to support Jewish education as the critical link in ensuring Jewish continuity and the increased engagement of all members of the Greater Dallas Jewish community. For more information, call 214-369-3313. Beth-El’s annual ‘FUNdraiser’: It’s time to celebrate 10 years! The entire community is invited to a celebration in honor of 10 fabulous years in Beth-El’s current building. The party is set for 7 p.m. on Saturday, May 1. Enjoy a delicious Tex-Mex dinner and margaritas. Back by popular demand, the BluPrint Band will provide great dancing music and tunes. And lastly, attire is casual — no need to dress up! The synagogue has a long and fascinating past. The history surrounding Beth-El’s three successive homes is full of inspiring stories of community, faith and exceptional individuals. The first Temple, on Taylor Street, was built in 1908. The initial money raised for that house of worship came from a “Temple sinking fund” into which each woman in the congregation contributed 25 cents per month. 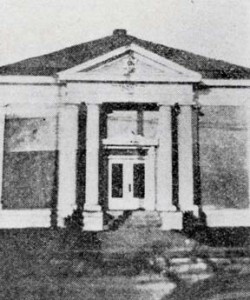 In 1920, the congregation moved into a larger synagogue on Broadway Avenue. Beth-El flourished and grew for 80 years at this location. In 1946, the Temple survived a three-alarm blaze. It was rebuilt, and the congregation was strengthened from the ordeal. The red-brick building at Broadway and Galveston had many beautiful limestone features and enhancements, some of which were carefully incorporated into the current building. Its present home on Briarhaven is beautiful and inspiring. The Building Committee, headed by the incomparable Irwin Krauss, worked long and hard to communicate to the architect exactly what was wanted. It is truly a pleasure to walk into this building and an even greater privilege to be able to call it home. In attendance will be the builder Jim DeMoss and architects from Hahnfeld Hoffer Stanford. Join the Temple community on Saturday, May 1. Your participation is needed, particularly at a time when endowment income is low and maintenance expenses are on the rise. There’s still time to join in the fun. For more information or a last-minute reservation please contact Julie Diamond at 817-975-0705 or at julie@diamondinternet.net by Friday afternoon. The presentation features stories and pictures illustrating the wide variety of experiences and cultures that Jews created and lived in during the centuries between the expulsion from Judea and the Renaissance. Bruce is now a full-time history student, but at one time he was associate general counsel for Verizon Wireless. He is an attorney, a father of two young children, a board member of Congregation Kol Ami in Flower Mound and a Sunday school teacher. He is a graduate of Virginia Military Institute and is now pursuing a master’s degree in history at University of North Texas. Lunch is catered by Subway Sandwich Shop, and guests have a choice of turkey, chicken teriyaki or tuna salad, plus chips, cookies, coffee or tea. Lunch is $9 person, or guests may attend for $4 for the program only. For reservations, call Fanette Sonkin, 817-346-4666, or Sylvia Wexler, 817-294-1129, or checks can be mailed to Daytimers, Beth-El Congregation, 4900 Briarhaven Road, Fort Worth, TX 76109. Happy birthday to Gayle Johansen! You’re tired, so you sit down for a while. Then when you’re rested, you stand up and get moving again. Well, the Dallas Holocaust Museum is out to change our definition of “standing up,” and our behavior. “Sitting down” isn’t even part of the equation. The Museum — also the Center for Education and Tolerance — has adopted “Upstander,” the word that’s on its way to becoming coin-of-the-realm everywhere Holocaust is a primary concern. It’s the opposite not of “downsitter,” but of “bystander.” The latter doesn’t have to sit down to be taking no part whatsoever in whatever’s going on. Bystanders are particularly dangerous, the Holocaust has taught us, when bad things are happening to human beings. Which is why a center like the Dallas one, which educates hundreds of school-age kids every week at its downtown facility, is so concerned with the latest, greatest problem emerging big-time from that group: bullying. Bystanders see, but let the bad things happen without taking any action. They don’t say no to anyone; they just keep quiet, as long as the bullying doesn’t target them. And in these situations, adults are often bystanders as well: parents who advise kids to “Just ignore it”; teachers and principals who look the other way, or take only ineffectual, minor-league stabs at action. Upstanders, on the other hand, do something, even if it means putting themselves at risk. For school kids, this can be very uncomfortable. For those who hid and/or otherwise rescued Jews during the Holocaust, this was far more than uncomfortable; it was often a matter of threatened life and potential death. But they did it anyway. That’s the latest lesson being taught at our Holocaust Center. The lesson itself may be uncomfortable. Kids hear survivors’ stories; it can be hard to take, trying to imagine oneself in a survivor’s place. But it happens. Alice Murray, the Dallas Center’s president and CEO, has heard kids leaving after such a presentation saying things like “I will never hate again.” Their schools, which often find these lessons the most compelling ones their students have ever had, report kids becoming more respectful of others. At the very least, this is a start. But among Holocaust centers across our nation and elsewhere, Dallas’ is certainly leading the way with the introduction of its compelling invitation to young people to “Be An Upstander.” At the end of its recent Yom HaShoah commemoration, our Center rolled out bracelets in black and white: “Upstander” in stark light letters against a solid dark background. The message and the choice are clear. These bracelets come wrapped with a pledge card offering the chance to be among the first official Upstanders. Kids 10 through 18 are in for $10, older individuals and whole families for $36. August will be the cutoff time for charter memberships. The pledge says it all: “From this day forward, I will STAND UP against prejudice, hatred and indifference in all its forms … for what is right … not just for myself, but for all of humanity.” Watch for a regional contest: Those up to age 22 may create a piece of music, a video or some combo of the two, illustrating the Upstander mission; YouTube airings are promised, plus professional packaging and promotion for the winner. What could beat fame and possible fortune achieved while helping a good cause? I now wear the bracelet on my right wrist, a worthy companion to the Sh’ma that always circles my left. And I shared its message with attendees at the recent Women’s League of Conservative Judaism conference in Dallas, who’ve taken it home with them. Will you join us? Get more information on Upstanding from Nanette Fodell at the Center, 211 Record St. #100, Dallas 75202; 214-741-7500. Like Lowe’s “Let’s build something together,” we’ll build a broadened Holocaust memory to extend far, far into the future. No one can afford to sit down on this job. I am experiencing a challenge to my sense of that which is appropriate behavior in the sanctuary, during a Jewish service; your thoughts and advice are needed. Last Sunday, I was at a minyan for the survivors of the Holocaust, there was a lot of history, pain, sorrow and tragedy present in that sanctuary. When I am in a sanctuary — that one or any other — it is a sacred place for me, especially during a service, providing me with the opportunity to get closer to Adonai. My problem: During the service on Sunday, there were several personal conversations taking place in the sanctuary. The folks who were chitchatting and chewing the fat were some of the most visible leaders in the Jewish community, and they did not appear to be discussing the Holocaust, or the survivors that were present. These discussions distracted me, and others, while we davened. I cannot imagine how the two survivors to my immediate right felt as they said Kaddish for family, friends and so many others who did not survive the Holocaust. There we were, with Jews that knew and survived the most ghoulish and insane nightmare known to mankind, most of us saying Kaddish for the 6 million that did not leave places such an Auschwitz-Birkenau, Treblinka, Dachau, Buchenwald and others, and yet — there were people present not respecting the sanctity of the moment. Why were they there? Did they not care about the solemnity of the event? Or, were they only thinking of themselves? I go to shul to pray, and socializing before or after the services is fine by me. But why come into the sanctuary during services, if you want to visit with your family and/or friends? Similar conversations are experienced at the synagogue that I attend, and I do not have a position where I can bring about change. Rabbi, please share your thoughts on the subject of “idle chatter” and/or private discussion(s) taking place during services. How you would deal with this issue as a rabbi? And, how can I, as a congregation member, help stem the tide of discussions at inappropriate times in the sanctuary? In departure from the style of our usual column, I am going to ask the readers to comment on this question, via e-mail or letter, over the next week, and after seeing your comments I will offer my remarks on this very sticky issue. Thank you for raising the issue, and I look forward to hearing from y’all! We are supposed to say this blessing when we see someone who looks different and when we see someone who is disabled; it gives us an opportunity not only to be thankful for what we have, but thankful that we can know people who look at the world differently. On Sunday, May 2 at 2 p.m. in the Zale Auditorium for only $5 a ticket, you can see an unusual performance of “Fiddler on the Roof.” Twenty-six adults with developmental delays are the actors in this special production. In addition, we have teen volunteers who have been working with us since January. This will be our 10th year of performance and we have grown in the number of actors and in the types of plays that we do. So why should you come and bring your children? The excitement and joy shown by each of our performers makes this a very special event. As you sit and watch the struggles and accomplishments, the important Jewish concept of “b’tzelem Elohim — being created in G-d’s image” comes alive. We recognize that each of us brings something special to the world and we are truly fortunate that we can be in a community with so many different people. On April 19, the Joan Katz Breast Center at Baylor All Saints Medical Center at Fort Worth officially opened to provide comprehensive, compassionate breast services on one campus for those diagnosed with breast cancer in Tarrant County and surrounding areas. Currently the Center offers a Nurse Navigation program to educate patients about their disease and treatment options. Since January 2008, the Center’s certified breast health nurse navigator for the Joan Katz Breast Center at Fort Worth has served over 725 patients. The Center offers a place for women to seek help, healing and guidance regardless of their ability to pay or where they are receiving their services. The Center also offers qualified leadership under the direction of Medical Director Anita Chow, M.D., Tarrant County’s first and one of only two fellowship-trained breast surgeons. A breast tumor board will conduct a weekly Multidisciplinary Breast Conference to review complex and reoccurring breast cancer cases to plan a treatment course in a prospective manner and discuss cases that require multi-specialty input. The Joan Katz Breast Center at Fort Worth is the place for comprehensive, compassionate breast services. Services include: patient navigation, screening and diagnostic services, education, emotional counseling, social services, genetic testing, patient and family support groups, lymphedema treatment, Motion for Wellness and Appearance Center. Joan Katz, a breast cancer survivor and her friend and college roommate, Roseanne Rosenthal, are the founders of Fort Worth’s Susan B. Komen Foundation, Walk for the Cure. They have devoted years to educating the public and making them aware of the severity of the disease. Today, the Susan B. Komen Foundation is world-famous. Chosen color of the organization is pink and symbolic pins, clothing and paraphernalia identify survivors and supporters of the disease. Joan and Roseanne are truly “women of valor,” and grateful women everywhere appreciate the dedication and devotion they have extended. They have brought light to a world where there was darkness. Camp Gan Israel in Arlington is delighted to announce its first season. Your children are certain to have a wonderful camp experience there. The counselors and staff at Camp Gan Israel are eager to greet your children and there are many exciting programs planned for this year. CGI is committed to providing a superb day camp experience for Jewish children in the Greater Arlington area. It offers outstanding athletic, sports and creative arts programs under the guidance of professional instructors who are all highly qualified in their fields. Family-oriented programs are also an important aspect of the camp, and parental participation in these special moments is encouraged. Camp Gan Israel is located at 5618 West Arkansas Lane, Arlington, TX 76016-1101. Camp dates are June 28 through July 2, and July 5 through July 9. Mini Gan, ages 20 months through 4 years: Monday-Friday, 9 a.m. to 1 p.m. Camp Gan Izzy, ages 5-9, Monday-Friday, 9 a.m. to 3:30 p.m.
Extended pre- and after-care is available by making prior arrangements with the camp. The fee is $4 an hour. Gan Israel aims to expose children to the widest array of activities, trips and educational programs. The daily schedule includes a mixture of sports, swimming, field trips, educational activities and crafts. A week generally includes two trip days (such as museums, blueberry picking, ice skating, etc. ), two swim days and Friday specialties. Rishi Gurevitch is the camp director. If you have any concerns, questions or suggestions, please feel free to call at 817-451-1171. Registration is now also open for Chabad Hebrew School 2010-11. You may reserve a space for your child by calling 817-451-1171. Information regarding other Chabad camps as well as Chabad Hebrew schools and their rabbis and teachers is available by calling Ms. Gurevitch. I remember well when all my children — Linda Wisch Davidsohn, Steve, Judy, Susan Wisch and Sharon Wisch-Ray — were fortunate enough to be confirmed at Temple Beth-El. I remember the beautiful ceremonies, parties and gifts the confirmation classes presented to the temple each year. It’s memories such as these that will be with me forever. I remember the late Rabbi Robert Schur’s words to his beloved students each year, just before summer vacation. He said, “I want each of you this summer to read a good book, take a long walk and make a new friend.” I remember his parting words to his congregation as he told them of his retirement because of the pending onslaught of Alzheimer’s disease. Beth-El is blessed today to have the leadership of Rabbi Ralph Mecklenburger, who has brought the congregation to even greater heights with his noted leadership; the creation of a new Beth-El Congregation, the magnificent new temple on Briarhaven and Hulen; the outstanding awards he has achieved; the educational and recreational facilities; and the countless other services he has provided for the community at large. Whether it’s at a B’nai B’rith function, Jewish Family Service event, lecturing at universities or speaking at interfaith ceremonies, whenever called upon, Rabbi Mecklenburger is ready to serve his fellow man. This year, Beth-El will have its confirmation service on Friday, April 30, at 8 p.m. This year’s class will be honored by their parents at a traditional, festive oneg Shabbat. Confirmands include Alex Keller, son of Stewart Keller and Nancy Keller; Bessie Bronstein, daughter of Antonia and Dale Bronstein; Chase Koger, son of Carol Koger; Jennie Brow, daughter of Jackie Brow; Drew Goldstein, son of Lara and Gary Goldstein; Chace Miller, son of Susan and James Miller; Meyer Wallace, son of Laurie Wallace; Emily Englander, daughter of Marilyn and Marty Englander; Jenna Lee, daughter of Judy and Jim Lee; Parker Miller, son of Susan and James Miller; Rory Ginsburg, son of Cara and Mark Jones; Stella Bronstein, daughter of Antonia and Dale Bronstein; Ted Dayton, son of Debra and Greg Dayton; and Joseph Clark, son of Sha’ron and Bill Clark. In the meantime, our friends at Congregation Ahavath Sholom are preparing for their confirmation service on Friday, May 28. Their class includes Emily Derozier, daughter of Arlene and Gregg Derozier; Alivia Berman, daughter of Karen and Danny Berman; and Cameron Nudleman, son of David and Elise Nudleman and grandson of Rhea and Paul Nudleman and Sal and Vicki Mitrani. As is our custom, the confirmands will be honored by their parents at the oneg Shabbat following. We are preparing our list of high school and college students and any awards they may have achieved in their educational pursuits. Please contact me at news@texasjewishpost.com or by calling 817-927-2831. This is an only-in-America story, something to reflect on in the month marking the 42nd anniversary of Dr. Martin Luther King, Jr.,’s assassination: Alysa Stanton, the first black woman rabbi, is a living success story deep in America’s South. This may be despite, or perhaps even because of, some factors besides race: She’s in her mid-late 40s, and the divorced mother of a teenage daughter. Chosen over six others for the pulpit of 60-family Conservative/Reform Congregation Bayt Shalom in Greenville, N.C., she was selected, its president said, because “We’re a one-synagogue town, so we need a rabbi who can reach out to all members.” She has certainly reached the community’s youth: Religious-school enrollment has almost doubled since she assumed her position there last October. She tried out several faiths, including Eastern and Evangelical, until finally finding her religious home while attending Colorado State University in her 20s. Studying Judaism along with a major in psychology, she was converted at Denver’s Conservative Temple Emanuel. After graduation, she worked as a grief and loss psychotherapist, and was one of the counselors called to Columbine following the 1999 school massacre there. The San Francisco–based Institute for Jewish and Community Research said last year that a surprising 20 percent of today’s American Jews are not Caucasian; they are converts like Stanton, or adoptees, or children born of mixed marriages. IJCR was founded by Gary Tobin, whom locals may recall as the engineer of a major Dallas Jewish community study a number of years ago. He passed away last year, just a few weeks after Rabbi Stanton’s ordination. Certainly we must not send away Rabbi Alysa Stanton, or others who may follow. You recently offered two columns in reference to the “Bodies” exhibit in which you elucidated your opinion that it flies in the face of the sanctity of the human body. I have trouble fathoming what sanctity there is to the human body any more than any other animal body. I assume you would not take such issue with an exhibit of animal bodies showing their anatomy, and would like to understand why your perspective is so different for humans, necessitating burial and nothing else. The holiness of the human body can be understood on a few levels. One area where the Torah reveals this is the prohibition to maim or to inflict any wound upon the body unnecessarily. Even if one wants to do so, we do not have that license as our bodies were not given to us to do as we want, rather entrusted to us as a sacred trust from the Al-mighty to use this body owned by Him — much as we do not own our children to do with them as we please, but were entrusted with them to help nurture them to grow in their own paths and lives. The body is said to be a partner with the soul in its struggle to serve G-d in this world. There isn’t a single mitzvah that the soul can perform without its cohort, the body. G-d purposely set up the world in that way; there are animals that are all body; angels that are all soul; and man, who is the combination of the two. This is the underlying foundation for the Jewish belief in the eventual Revival of the Dead. That period, also known as “olam haba” or the Next World, the final world of the ultimate reward, must first be ushered in by the reunification of the bodies with their souls. Why is this so? Why cannot the souls themselves, which are eternal, receive that reward? My late mentor, R’ Shlomo Wolbe, explained that it is only fair that both partners, the body and the soul, should together share in the final, ultimate bliss which could come about only as the result of their partnership. Since all the mitzvot were performed with the body, the soul could not possibly receive that reward alone. This speaks volumes about the way we look at the human body. The Kabbalistic writings closely connect every limb, muscle and sinew of the human body to a specific mitzvah of the Torah. There is said to be a count of 248 limbs and 365 main sinews of the body, corresponding to the 248 positive mitzvot (the “dos”) and the 365 negative mitzvot (the “don’ts”). Every time a mitzvah is performed, the part of that body which parallels that mitzvah becomes elevated and sanctified. Throughout the Torah we find G-d described in human terms: He took us out of Egypt with an “outstretched arm,” His “eyes” are upon us, He “hears” our affliction, etc. This is difficult to understand as it is a core belief of Judaism that G-d has no physicality. One answer given by the commentators is that these are anthropomorphisms, a way for us to have an inkling of what G-d brings about using human experiences we can appreciate and fathom. The deeper answer given by the Kabbalists is that all that G-d performs in this world is parallel to similar attributes in the human body. There is a type of “spiritual human body” which is the sum total of all the upper, spiritual worlds. G-d created the physical human body in sync with all that He wishes to relate and express through His divine providence throughout human history. This is an entirely new insight on the loftiness and holiness of the human body; its very essence is nothing less than an expression of G-dliness in the world. This is implicit in the verse that man was created “in the image of G-d” (Genesis 1:27). This explains the tremendous responsibility we hold to be the proper stewards of the gift of the body we have received, and our obligation to treat it with the proper respect and sanctity it deserves.